Think about what you want in your landscaping design and how you will use your landscape. Curb appeal, formal entertaining, herb gardens, and children’s playgrounds are all possibilities. Don’t limit yourself to plants and trees; maybe you would like a fence, a pool, a fountain, a pond, a deck, a patio, or other outdoor elements like a personalized outdoor kitchen. Make a realistic budget. One rule of thumb is to invest 2 to 5 percent, and up to 10 percent of your house’s worth. If this seems steep, consider that appropriate landscape improvements are estimated to return 100 to 200 percent of their cost when a house is sold. Look at landscape books and outdoor magazines for ideas and start a file of plants, trees, gardens, yards, pools, patios, decks, fences, etc., that you like--or dislike--to show your Personalized Lawn Care Landscape Designer. Also visit Personalized Lawn Care’s plant index using the link on this site's home page. This will help you communicate what you want to achieve—or avoid. Ask about maintenance. Some homeowners enjoy working in their yards and gardens, some hire a service to do it, and others don’t want to bother with it at all. Be sure to let your Personalized Lawn Care Landscape Designer know how you feel about the upkeep of your investment. Personalized Lawn Care has multiple maintenance programs to fit your budget. According to Money magazine (May 2003), spending on landscape design and installation has more than tripled in the past five years, hitting $14.3 billion in 2002. And no wonder—it offers the best return on investment of any home improvement you can make. Many savvy homeowners are hiring landscape designers to help them realize their dreams. Spending 5 percent of the total value of your home on landscaping, and doing it wisely, you can add 15 percent or more to the value of your home. One important landscaping tip to improve your front lawn and your driveway is by adding some very creative visual designs to the sides of your driveway such as a fence or rock garden. Another great idea for improving the look of your front lawn is to include a footpath to your home. If you’re sick and tired of people trampling over your lawn and ruining over your plants, consider placing a footpath that’s outside of the way where normal foot traffic is present. Performing landscaping around the sides of your driveway is a very cost-effective way to brightening up its appearance using only softscape fixtures. Before you know it, you will have an attractive and far more appealing front lawn and driveway by giving it some color, depth and character. If you would like more information on landscaping design ideas please contact us Personalized Lawn Care LLC for a free consultation on your landscaping design vision. We would be happy to answer any questions you may have. 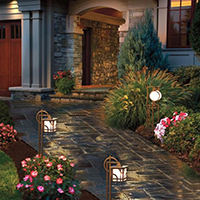 When the sun goes down and everywhere else is dark, why not show up your home with landscaping lights? Landscaping lights can help to enhance the pure beauty of your home. By illuminated the outdoor surroundings of your home, you will be able to show off your landscape surroundings and truly enjoy the outside as the sun goes down. What can landscaping lights do for you? They can help to highlight trees, bushes, shrubs, flowers and even give a very attractive effect to the fountain sculptures or other breathtaking landscape points of interest. What is important to consider in developing a game plan to determine where you want to install your lights to help bring out the sheer beauty of the outdoor surroundings your home’s landscaping. Some helpful tips to keep in mind when designing landscape lighting is to make sure that you conceal the light source, never illuminate an object too much, simply highlight your subjects, be sure to use solar cells or timers to turn your lights on and off, and make sure that your lights are pointing at your property and not someone else’s. By keeping these tips in mind, you will be able to successfully show off your outdoor surroundings without wasting power or angering any next-door neighbors with lights shining at their house. If you would like more information on landscape lighting please contact us Personalized Lawn Care LLC for a free consultation on your lighting needs. We would be happy to answer any questions you may have. Probably one of the most sought out dreams of the typical residential resident is that fabulous in ground pool everyone wishes they could have. Though there are many kinds of pools you can buy which are relatively cheaper than a landscaped in ground pool, it’s just not the same as having a pool in your back yard in the ground. Surely most would agree. Above ground pools are good, but they do pose the danger of screws loosening, bolts coming undone, the sides buckling and many other things that are just too long to list. Landscaping around these pools however takes some these flaws away by hiding the metal sides putting the nature around the pool where it is intended to be. In ground pools can range in prices depending on the route you wish to build the pool. Typically there are three types of material you can use to make an in ground pool. There are cement, fiberglass, and the other is a rubber-like liner. Concrete pools require forms to be made and concrete poured into them after the pool has been dug out. After the concrete is poured, cured and tiled there must be drains and other such things added to make the pool operate properly and clean. This route is a more expensive way to build a pool. Fiberglass pools are per-formed shells of which are just dropped in a pre-dug hole. These fiberglass shells are easy to keep clean and last for a long time with less maintenance than a concert pool shell. The fiberglass shell are more cost efficient. A less expensive way of in ground pools is by using a rubber-like liner to line a pre-dug pool hole. Once the hole is dug and the liner is laid in place you can put flat stones, rock crush or any other such things around it so it looks more attractive than just a rubber liner in a hole in the ground. Once you decide on what the type of pool you are looking for, the next step will be a soothing landscape design which will be created to complement you and your new pool purchase. The landscaping design is the 2nd most important thing to consider after you purchased your pool. 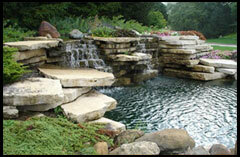 The landscape design is what pulls together the whole project. Take a look at our plant index for plant ideas. This may help you decide what theme you would like to have around your pool. If you would like more information on in ground pools or landscaping designs around your pool please contact us Personalized Lawn Care LLC for a free consultation on your pool needs. We would be happy to answer any questions you may have.